Like a great many developers, Gameloft has resorted to rolling in-app purchases into most of its games. One notable exception to that de facto rule is the new installment of the Modern Combat series. 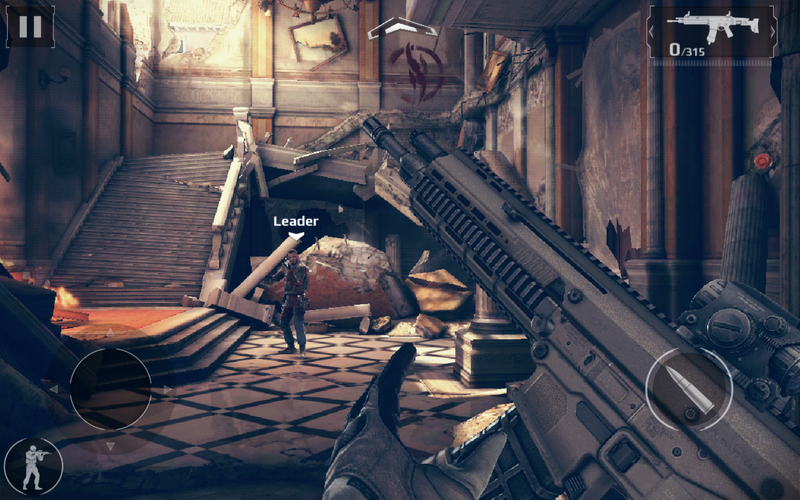 These games have much more production value than any other mobile first-person shooter, but this is a genre that's notoriously hard to adapt to touchscreens. 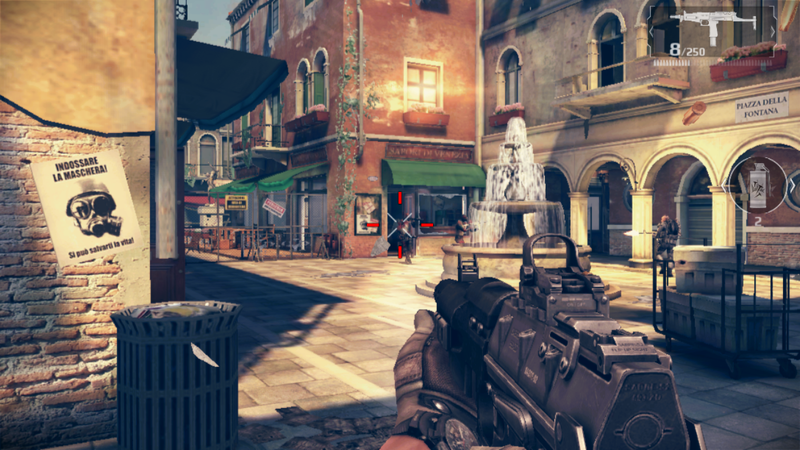 So, can a big production budget make Modern Combat 5: Blackout worth your time? Modern Combat 4 focused on an intricate and ultimately uninteresting story about a terrorist who took every opportunity to remind us he was the bad guy through the use of torturously long cut scenes. 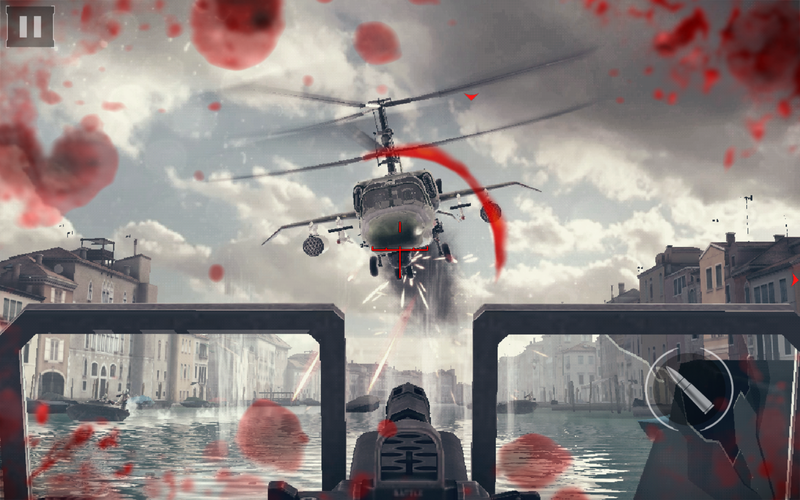 Modern Combat 5 is still about terrorists blowing stuff up and shooting people, but there's less time spent on an attempt to flesh out everyone's motivation for shooting stuff. If you ask me, that's a good thing. 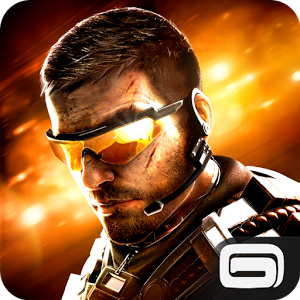 The story is no more compelling in MC5, but it stays out of your way more than in the last installment. 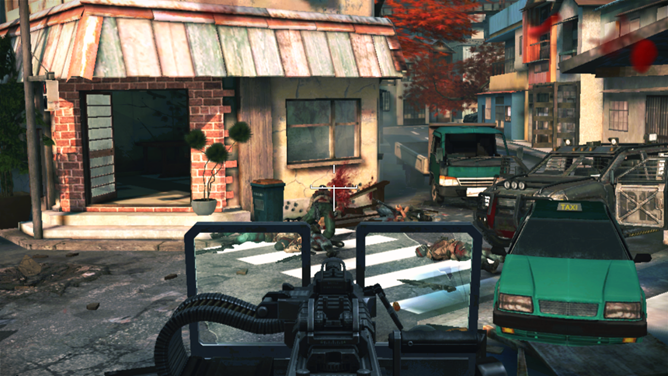 The game's story mode takes place across six different zones including a Buddhist temple, a bustling metropolis, and a military base. Each area has 4-6 missions that advance the story, which is mostly about figuring out what these terrorists types are up to (it doesn't really matter—you still just shoot all of them). After finishing those missions, there are a few "spec ops" levels to go through in the same zone. These are quick one-off missions that might call upon you to cover your team from a sniper perch, breach and clear a few rooms, assassinate a target, or rescue a hostage. The level design is reasonably good, and the spec ops stuff is surprisingly fun. I actually replayed some of these missions just because. 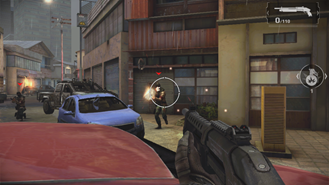 Modern Combat 5 includes a few different classes you can play including assault (rifles), heavy (shotguns/explosives), and sniper. Not all classes are unlocked at the start of the game, but seeing as there are no in-app purchases, you can unlock things pretty easily just by playing the game. In addition to all the classes, there are multiple guns, attachments, and secondary weapons to unlock. Basically, there's a bunch of stuff and it's oh so great to not get the hard sell every five minutes to get access to it. Some upgrades to your units earned through leveling up can only be used in the multiplayer mode, which is pretty straightforward as shooters go. You have game types like deathmatch, team deathmatch, and capture the flag. I have no real complaints about multiplayer separate from my general gripes about the controls (see below), except for some possible balance issues in matchmaking. One undeniable advantage for Modern Combat 5 compared to other multiplayer games is that there are actually people playing it. I've lost track of how many games I've seen with online components that were little more than ghost towns. In Modern Combat 5, I was able to find a game in a matter of seconds. Okay, let's talk AI—it's still kind of dumb. I have yet to play a shooter on Android that has impressive AI that can avoid making stupid mistakes, and Modern Combat 5 continues the trend. Look at the image below. 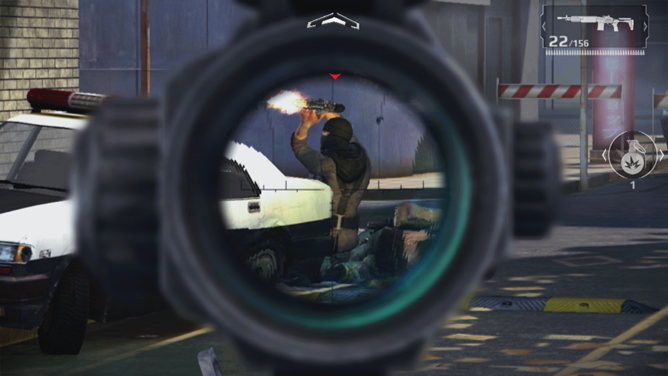 See that guy I'm pointing my gun at? 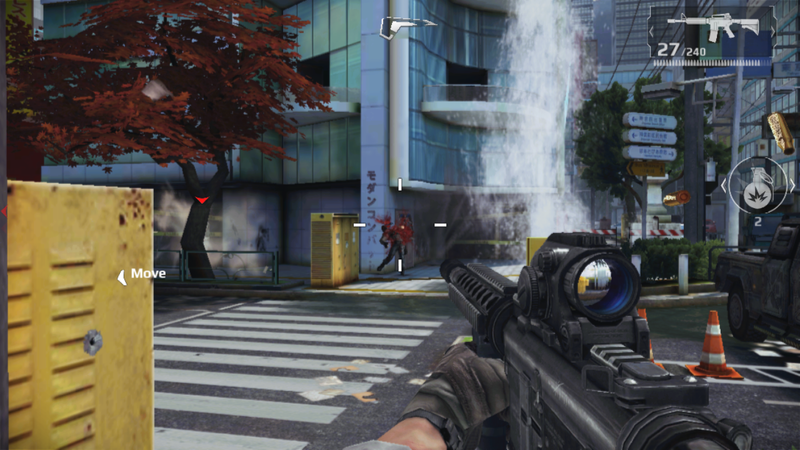 He's "in cover," but his head is clearly exposed to all the people shooting at him. There are a lot of little things like that; enemies standing still out in the open, taking cover where there is no cover, and generally making themselves easy to hit. It's not as egregious as some games I've played, but don't go in expecting a ton of clever AI soldiers to flank you—they can barely manage a frontal assault. I do have one more ongoing concern with Modern Combat 5, and this might be a deal breaker for many of you. You need to have an internet connection to play the game—yes, even the single player. Frankly, I can't think of any good reason other than (maybe) combating piracy. The game comes with the first zone when you download it, but the others are loaded when you unlock them (a nice feature, actually). So of course you need a connection for that, but I'm talking about levels you are currently playing. If you lose connectivity for even a moment, the game pauses and tries to reconnect. You cannot play until the server has been reached. 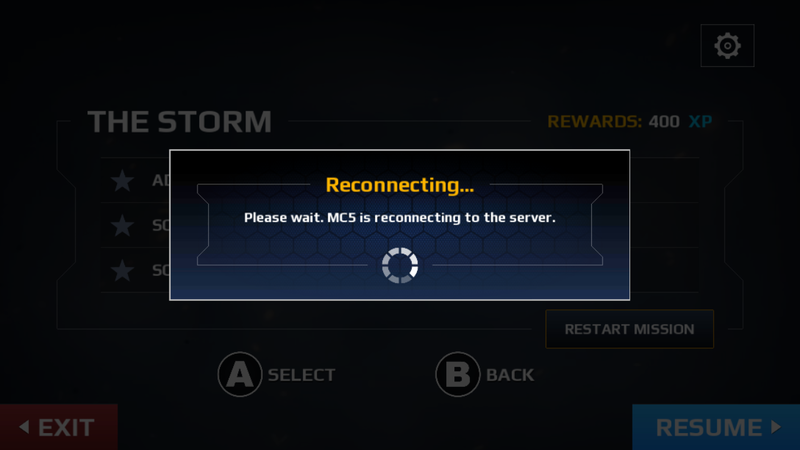 The first day I had Modern Combat 5, it seemed like the connection was lost every few minutes. I have no idea why, but there might have been some issues on Gameloft's end. It's been better since then, but I really have to wonder why anyone thought this was a good idea. Single player games should not arbitrarily require an internet connection. 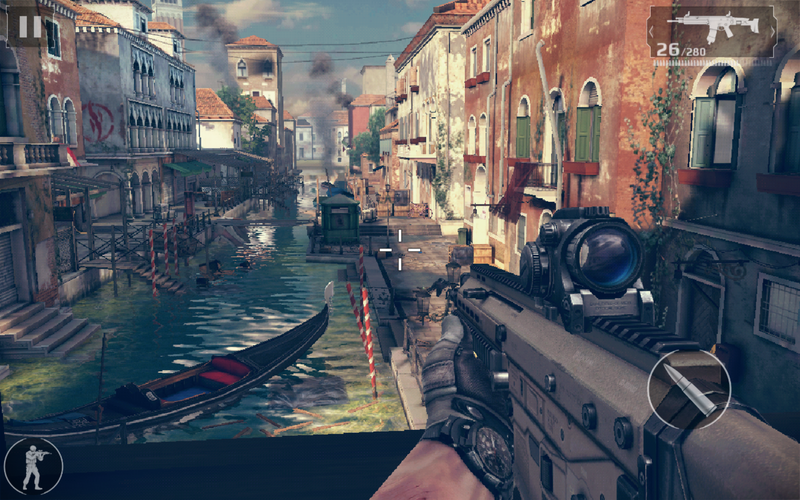 If you've played any of Gameloft's previous shooters (especially Modern Combat 4), you won't find many surprises in the controls for Modern Combat 5. The various on-screen control schemes rely on some arrangement of dual thumbsticks. Drag on the left side of the screen to walk forward/backward and strafe side to side, and use the right side to aim. Here's where things get weird—when you want to fire, you pick up your right thumb and press the floating trigger button. While pressing this, you can still drag around to refine your aim, but nothing is going to make that process completely smooth. Modern Combat 5 has extremely aggressive aim assistance on by default, and frankly, I can't imagine playing this game on a touchscreen without it. I say this as someone who plays a lot of shooters with a keyboard/mouse and a controller. 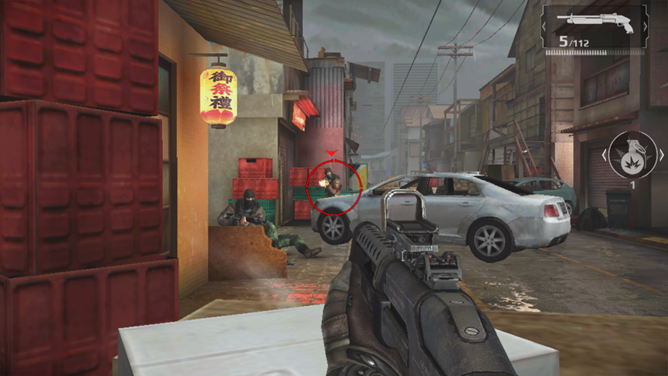 Once your crosshairs find a target, your aim will actually stick there, even if the enemy should run a short distance. It's weird, but you'll wrestle with the controls enough even with the auto aiming. Sometimes it can get incredibly frustrating as you switch back and forth between swiping and tapping the fire button, always feeling just a little disconnected from the action. 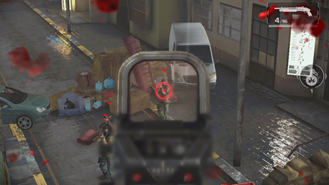 The bottom line is that on-screen FPS controls are awkward, but I will grant that Gameloft has done the best job of making a shooter enjoyable on a touchscreen. I guess you could say the controls are good... in the context of other mobile first-person shooters. If you're not wiling to settle for barely passable controls (and you shouldn't), your best bet is to pair a controller with your device. I tested Modern Combat 5 on the Nvidia Shield, which is fully supported as a controller. Most other HID devices with the standard layout should work too. 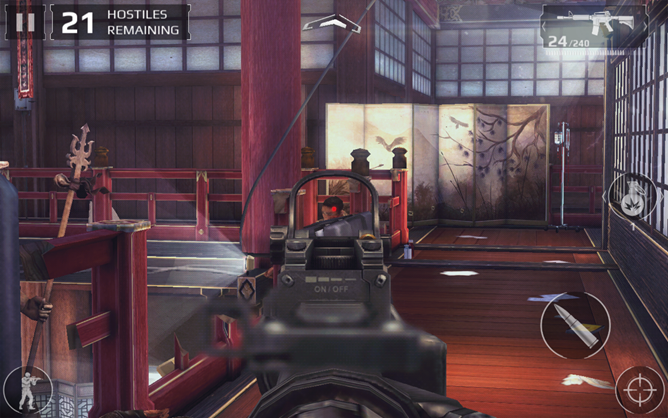 Using a controller instantly makes MC5 more playable (you need to increase the sensitivity, though). The difference is actually huge. With touchscreen controls I feel anxious and off-kilter playing Modern Combat 5, but I'm instantly at home with the controller. That's not just because I'm used to a controller, but the precision of a physical thumbstick is higher, and (importantly) you can fire while aiming without moving your thumb from the stick. I feel like we've reached the point where perhaps we need to admit that FPS games are never going to be great with touchscreen controls. With a controller, Modern Combat 5 is actually completely playable, but it's only barely acceptable on the touchscreen. This disconnect might be most evident by the way I completely destroyed the competition in online multiplayer mode. I suspect most of them are playing without a controller, giving me a huge advantage. Console-like graphics, you say? I'd really like it if everyone could stop saying that. 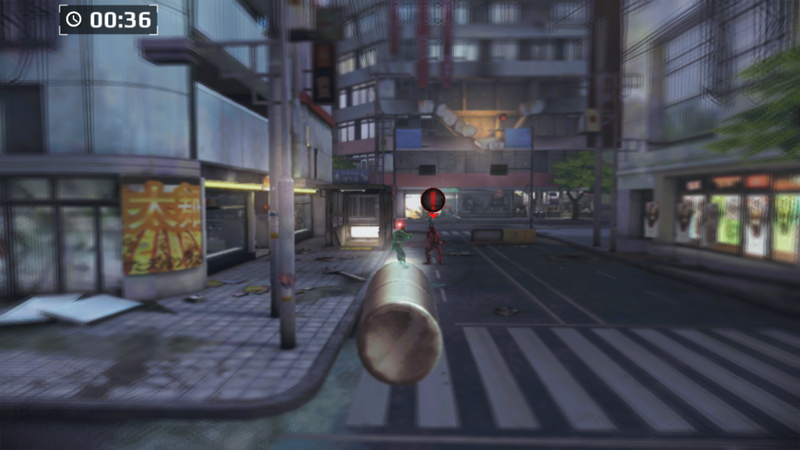 I have yet to see a mobile game with console-like graphics, with the possible exception of some of the better Tegra-exclusive titles, but even then it's older consoles. 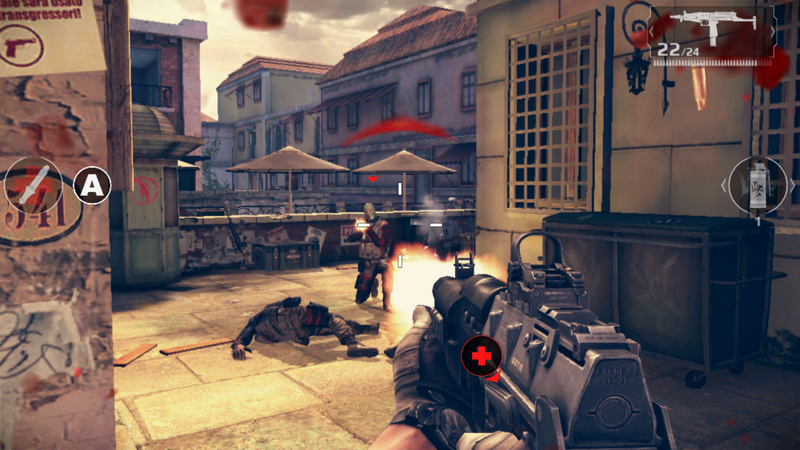 Modern Combat 5 looks good for a mobile game, but console-like it is not. The game will default to "optimal" quality when you install it, but the specifics of optimal depend on your hardware (I suspect many of the complaints about graphics are because of this automatic setting). On the Nexus 7, I found the default settings to be a little lackluster (those are the screenshots with on-screen buttons). The textures were a little muddy and aliasing was pretty obvious during gameplay. 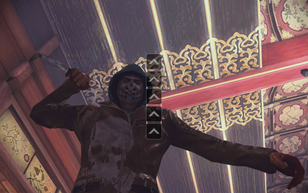 Cranking it up to the higher quality setting made the game lag a bit too much. The Shield, on the other hand, looked much better at optimal settings with improved smoothness, lighting, particles, and textures. The game played perfectly maxed out on this device. Modern Combat 5 is an ambitious title, to be sure. The environments are large and open. The game does guide you more or less in a certain direction, but you're not closed in a tiny space, and you won't have to wait while new parts of the level load. 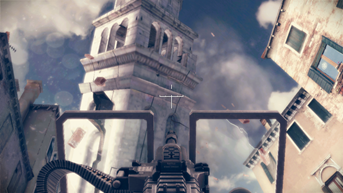 The promo video might not be indicative of the experience you'll have when playing Modern Combat 5, but it's a good looking game overall. You can play Modern Combat 5: Blackout on a touchscreen, but it's not fun. At least it wasn't fun for me. Even with the auto aiming and generous hit boxes, I was constantly annoyed with the lack of precision. It's not that Gameloft stinks out loud at implementing FPS controls on a tablet or phone, there just aren't any good options. I'm sure there are people who will overlook the awkwardness of touchscreen shooter controls, but I feel like I'm over that. It doesn't work very well and it never will with the technology we currently have. I want to play fun games, and a shooter isn't fun with on-screen controls. 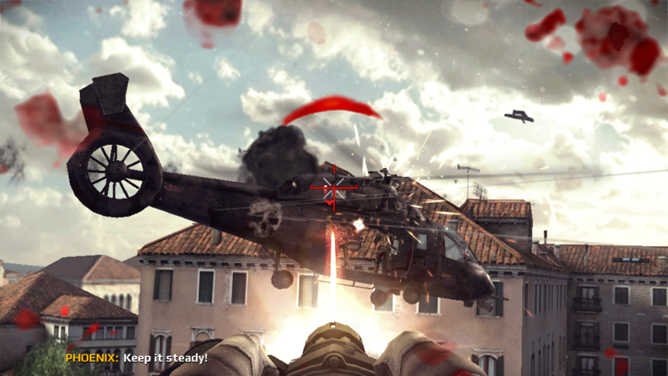 With a controller, Modern Combat 5 is a fun game. The difference is so stark that I can really only recommend buying it if you intend to play with a controller. The story didn't really strike me as interesting or relevant to the gameplay, but it seems to have been deemphasized this time, which I'm fine with. The lack of IAPs is a total win, though. It's refreshing to play a game with unlockable content that isn't tied to a paywall. Yes, MC5 is a $7 game, but you get everything for that price—and there is a lot of content here. So you should consider picking up Gameloft's newest shooter, but only if you have a controller or hate yourself a little bit.